Hey everyone! Here is a short video review of Tsujita LA Artisan Noodle's tsukemen dish. Enjoy! Mare is a fairly new restaurant by chef Eric Greenspan. Set in the back of his already situated restaurant Greenspan's Grilled Cheese, Mare exonerates romanticism and warmth throughout the patio restaurant. To actually enter the restaurant, you have to pass through the dishwashers and kitchen of Greenspan's Grilled Cheese. A hostess will greet you once you open their doors. A straight up patio with no real roof, only what seems to be a retractable one. No reservations can be made with a party of less than 6, so during a weekend, it can get pretty crowded. The menu is specifically focused on seafood, which includes clams, mussels and shrimp. Broths for the dishes are accompanied by pasta and a poached egg. There is a whole branzino on the menu for $18, which is quite a steal for sharing amongst two people. The bread they bring out is delicious, crisp on the outside and chewy on the inside, almost resembling an everything bagel. It comes with a few spreads that complement the bread nicely. MY FAVORITE DISH. SKIRT STEAK ($18.00): Oregano Chimichurri and Sea Urchin Butter. I really thought for a skirt steak, this was reasonably priced. The sea urchin butter was super creamy and delicious. I loved the oregano chimichurri, which added a depth of flavor that you can't get with butter. The steak was cooked well (medium-rare like we asked). You do have to specify how you want your steak cooked cause they probably won't ask you. It definitely was my favorite dish of the night and a good appetizer to share. CHOOSE YOUR SHELLFISH: CLAMS; CHOOSE YOUR BROTH: SPICY SAUSAGE ROMESCO ($17.00): For $17, this is a steal. They provide a fair amount of clams for the reasonable price. The dish comes with spaghetti and a poached egg to thicken the broth. Unfortunately, for me, the flavors didn't have much depth nor did the broth thicken with the egg. I was a bit disappointed. Maybe the other broths would have been a better choice. After finishing my clams, I ate the broth and the spaghetti like a bowl of ramen noodle soup. The spaghetti noodles that are provided with the shellfish dish. You can ask for more noodles if you run out. CHOCOLATE CHILI CREPE ($9.00): with Nutella and Coffee Whipped Cream. I absolutely hated this dessert. It was my friend's birthday (hence the candle) and the crepe tasted burnt. The coffee whipped cream was pretty nice but it didn't salvage the burnt and dry crepe. Wouldn't order this again. Overall, Mare is decent and the prices are reasonable. I like the concept but I feel some dishes need to be executed better. We were given the egg and spaghetti to our table and weren't told what to really do with it. I wish the broths had a deeper level of flavor but then again, there are many other broths to choose from. It can get chilly outside and they do provide heat lamps, but I would suggest you calling the restaurant to see if they're open on a rainy day. I swear. I think I have a problem. I found my addiction. When it comes to burgers and fast food (which doesn't taste really like fast food), In-N-Out is my go-to spot. I don't know what it is. It could be that everything is cooked fresh and made to order. It could be that the patty to bun ratio is perfect. It could be that the sauce is smothered without being overly smothered. Or it could be that you could order your burger however you like, to your satisfying needs. Whatever it is, I'm addicted and so are most of Southern Californians. DOUBLE DOUBLE COMBO ($6.80): Double meat and double cheese with onion, fries and a drink. This is one of the best burgers around. Cheap, simple and simply delicious. The iceberg lettuce offers a crisp crunch to the already perfect bun: patty ratio. The sauce, oh man, I can't get enough of it to the point where I ask for the spread packets so I can dip my fries in them. Downright good. Plain and simple. 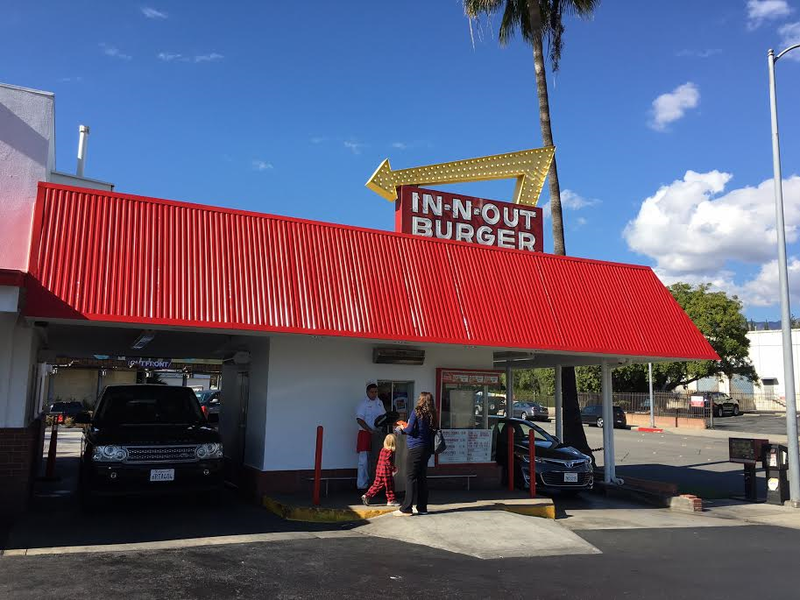 Overall, In-N-Out isn't just any fast food joint. It probably is the best fast food joint around without leaving you feeling gross. It tastes fresh and I love how they have a secret menu! To be honest, when I had my first bite of In-N-Out, I didn't love it. Then, I had another and another, and then it grew on me. I now have to have it at least once a month or I'll be a sad piglet. It's truly a place where all visitors from around the world have to check out at least once in your lifetime. I loved the flavors of Pok Pok during my visit to Portland. So when I first heard that Pok Pok was coming to LA, my heart was filled with food ecstasy. I could finally taste those Ike's Vietnamese wings as often as I would like, right here in the heart of Los Angeles. James Beard Award winner Andy Ricker is the heart and soul behind Pok Pok. The chef, who resided in Thailand, researched the food to bring authentic dishes to us, hungry piglets. Majority of the dishes are Thai based, but there are a few that come from the streets of Southeast Asia. The décor is pretty simple and is reminiscent of a pub found in Thailand. There are Christmas lights that brighten up the dining room. Pink, plastic tablecloths with floral prints line each table giving the place some color. There is patio seating as well for the warm, summer months. MANGO ALEXANDER ($12.00): Mango, Vodka, Coconut Cream and Lime, Shaken and Served Up. O-M-G! This drink is absolutely amazeballs! I couldn't get enough of this drink to the point where I felt the need to attempt to recreate it at home. It's thick, sweet, and full of deliciousness in a cup! A MUST ORDER! YUZU-HONEY WHISKEY HOT TODDY ($12.00): Korean Yuzu-honey tea with bourbon. If you were ever sick, this is the drink to cure all! It's warm in your tummy and not overly sweet. Smooth and soothing to your throat. Love this! MY FAVORITE DISH. IKE'S VIETNAMESE FISH SAUCE WINGS ($15.50-available in spicy): Half dozen fresh whole natural chicken wings marinated in fish sauce and sugar, deep fried, tossed in caramelized Phu Quoc fish sauce and garlic and served with Vietnamese salad. These wings are absolutely amazing. Who would've thought a cook of the restaurant would be the man behind creating one of Pok Pok's signature dishes. So much flavor packed into these little wings. It was a little on the "fishier" end than how I remembered them to be in Portland, but good nonetheless. The garlic and caramelized fish sauce gave the dish depth and richness. I just wish there was more! KAI YAANG ($14.00-HALF BIRD):Roasted Mary's natural chicken stuffed with lemongrass, garlic, pepper and cilantro, served with spicy/sweet/sour and tamarind dipping sauces. This was my least favorite dish of the night. Some parts of the chicken were quite dry. The flavor of the chicken was good, but compared to the other dishes, it didn't live up to the level of execution. KHAO SOI ($16.25-CHICKEN OR VEGETARIAN): Northern Thai mild curry noodle soup made with our secret curry paste recipe and house pressed coconut milk , served with house pickled mustard greens, shallots, crispy yellow noodles and roasted chili paste. This one pot dish was my second favorite dish of the night. It was rich and not overly powered with curry. I loved the crispy noodles and I definitely could just go to Pok Pok and have this as my main meal. KAENG HANG LEH ($16.00): Northern Thai sweet pork belly and pork shoulder curry with ginger, palm sugar, tumeric, tamarind, Burmese curry powder, and pickled garlic. This dish was one of my favorites of the night. It was rich, savory, and the pork belly was so tender that a fork could just pull off the meat. I thought the dish developed deep flavors and it went perfect with our coconut rice. KHANOM PANG AI TIIM ($7.00): Coconut-jackfruit ice cream served on a sweet bun with peanuts, sweet sticky rice condensed milk, and chocolate syrup. I hated this dessert and I normally don't hate desserts cause I'll eat anything sweet. The ice cream was a bit icy and the bread-ice cream ratio was way off. Just too much bread for so little ice cream. Texture wise, I wasn't fond of the sticky rice under the ice cream. To me, everything just didn't mesh well together. Overall, Pok Pok LA is still pretty darn good for Thai food. I'm still really happy it finally has landed in LA after all this time. Chef Andy Ricker has done something special to this place to recreate what would seem like a restaurant in Thailand. The drinks are phenomenal and the food is fantastic. I also appreciate that he puts a little background of where the dishes came from on the menu (although it does read a bit long). My only complaint is that they delivered all the food at once so we were left with no space for our plates. We actually had to use the table next to ours to place some of the food that was delivered. If they staggered the food, I would have been more of a happy camper. Cakes, sweets, and desserts are my specialty; not making them per se, but eating them! I love sweets and I have the biggest sweet tooth ever! When I heard that a new bakery had rolled up in Los Angeles, I knew I had to try it! Cake Monkey Bakery was started by Lisa Olin and Elizabeth Belkind. Their creations are simplified to recollect your favorite childhood treats. Everything from their classic chocolate cake to their cakewich brings you back to when you were a kid, sneaking in a bite or two when you weren't supposed to (or maybe that was just me). The new bakeshop is their first actual storefront. Their treats were once sold at various locales, but now, you can actually pick and choose what you want with a view of their delicious baked goods. CAKE MONKEY MOGULS ($3.50): For all you snowball fans! Vanilla cake with homemade Caramel filling. Marshmallow frosting and toasted coconut. This was delicious. It was moist and gooey and satisfying all in one go. I definitely enjoyed the toasted coconut and I don't even like coconut! BROWN BUTTER PECAN PIE ($35.00-WHOLE): This is a delicious pie! I'm very particular when it comes to pecan pie, but this is a good one. It includes toasted cocoa nibs to give it that extra chocolate flavor without taking away from the pecans and the gooey filling. ROLL IN THE HAY ($3.50): Vanilla cake with lime buttercream, white chocolate chunky pearls, and raspberry jam, lightly rolled in coconut. Awesome. This isn't super sweet and the lime buttercream gave it that extra zing. I definitely liked the raspberry jam. This is a good snack! MY FAVORITE DISH. THE CLASSIC ($7.00 slice): Vanilla cake with milk chocolate buttercream. Wow! Amazing. It definitely is what a homemade classic cake should taste like. Its decadent without being overly sweet. I loved the moist texture of the cake and the milk chocolate buttercream was delicious. Cake Monkey Bakery is an awesome bakery. The staff are friendly. Their variety of baked goods are numerous. And you are left smiling when looking at the display of cakes and cookies and pastries! They do mini cakes as well starting at $7.00, which are kinda cute. I appreciate the concept of making you reminisce to your childhood favorite treats. They also have an espresso machine at this location to go with your baked goods. The store front is fairly small and isn't an ideal place to sit and hangout (just two bar stools that face the street). Additionally, if you don't live in the area...don't worry! They will ship accordingly. Just check out their website. Yang Chow is one of those restaurant institutions that has been around for awhile. The first Yang Chow started in Chinatown in 1977 and has since expanded to two other locations, one in Pasadena and another in the Valley. If you visit the Chinatown location, you can see walls full of celebrities who have visited the restaurant. Yang Chow serves up Mandarin and Szechuan cuisine. The restaurant was featured in the LA Times back in the 1980s and gained much popularity ever since. Yang Chow is known for the Slippery Shrimp and every single time I visit this establishment, it is a must order in my book! COLD NOODLE WITH SESAME ($7.95): This is a nice way to start your meal. Located in the appetizer section, the noodles had a delicate, chewy texture with a cold temperature to resemble a salad. The sesame peanut sauce was delicious. I appreciated the slices of cucumber for a refreshing taste to the palate. MY FAVORITE DISH. SLIPPERY SHRIMP ($16.50): This is a must order at the restaurant! The pieces of shrimp were delicate with a crispy coating on the outside. An orange and garlic sauce coat the shrimp nicely with hints of ginger throughout the dish (think orange chicken but with shrimp instead). Supposedly this dish is spicy, but I felt there was no spice at all. This dish is the only reason I visit Yang Chow. SZECHUAN BEEF ($15.95): This is a good dish, not amazing. The pieces of beef were fried crisp and coated with an orange peel sauce. The sauce is quite similar to the slippery shrimp dish, except this is more savory. Still good nonetheless. Overall, Yang Chow is pretty decent if you're just craving some Chinese flavors. I wouldn't say that it's authentic per se, but it is quite tasty. It is an institution in Chinatown and I believe it is worth a visit. The Chinatown location actually tastes better in my opinion, but the parking can get quite crazy there.